What does the Fourth Industrial Revolution mean to you? Do you fear robots or self-driving cars taking your job, or do you see the blockchain, 3D printing or any other fast-developing technology as an opportunity to create a business, overtake the competition or build a fairer, more equal society? This is the question that will play out at the World Economic Forum on Africa next month in Kigali. For Africa, this coming tide of change offers an unprecedented opportunity to catch up and even overtake decades of under-investment by building modern, vibrant economies with the continent’s best natural resource – its people – rightfully at the centre. But there will be challenges, too. Automation in industry and the services sector will threaten both white and blue collar jobs; poor education could leave a generation of young school and college leavers without the skills required to compete in an increasingly competitive global digital marketplace. I strongly believe that the 21st century will be Africa’s century, that its young population has the potential to build a world where they are not only materially better off but also where things are fairer, more sustainable and more tolerant than at any other time in history. Creating this entirely realistic future just means mastering the Fourth Industrial Revolution, and this requires innovation on a scale previously unseen on the continent. Let’s start with the positives. In the past three months alone Rwanda has announced plans to build the continent’s first research centre for quantum computing . At the same time, two Nigerian tech businesses – e-commerce giant Africa Internet Group and fintech specialist Interswitch – are racing to become the continent’s first unicorn , a private tech company valued at a billion dollars or over. And Nigerian schoolgirls recently built a r obot to tackle household waste . We need to keep this pipeline of promise brimming and this means doing everything we can to empower the next generation of start-ups and entrepreneurs. At the World Economic Forum on Africa, we will be celebrating the spirit of entrepreneurship, from the Technology Pioneers leading pioneering video search and offgrid power supply, to the Global Shapers , Young Global Leaders and Social Entrepreneurs redefining the parameters of success in this time of digital transformation. In keeping with our focus on young champions, we are also launching our challenge to find Africa’s top women innovators. Unless women are to make a full contribution, Africa will never master the Fourth Industrial Revolution. This is why we want to showcase Africa’s very best female technology entrepreneurs in Kigali in May. 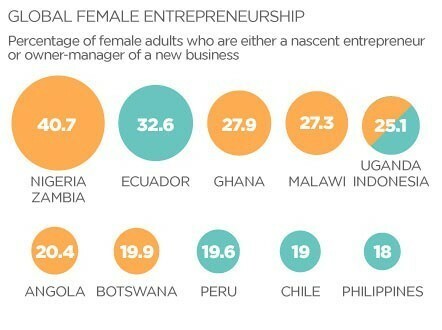 We already know from research that there are lots of them out there: according to CNN, Africa leads the world in the number of female entrepreneurs. If you are a female technology entrepreneur based in sub-Saharan Africa with a business between one and three years old that is scaleable, with proven innovation or proprietary technology and a record in delivering social impact, you can apply here or fill in the form below. Working with the Forum’s Global Agenda Council on the Economics of Innovation , as well as our Impact Investing and Social Entrepreneur communities and a selection of experienced judges, we will select the very best entrants and invite them to next month's meeting in Kigali, where they will be able to meet investors alongside other leaders from across business, politics and civil society. What are you waiting for?